I’ve been wanting to use this stamp from Rubber Necker for quite a while. In fact, I’ve easily had it for over a year! I’m pretty happy with this card, but if I made it again, I would put a mirror in the frame that the bird is flying out of. 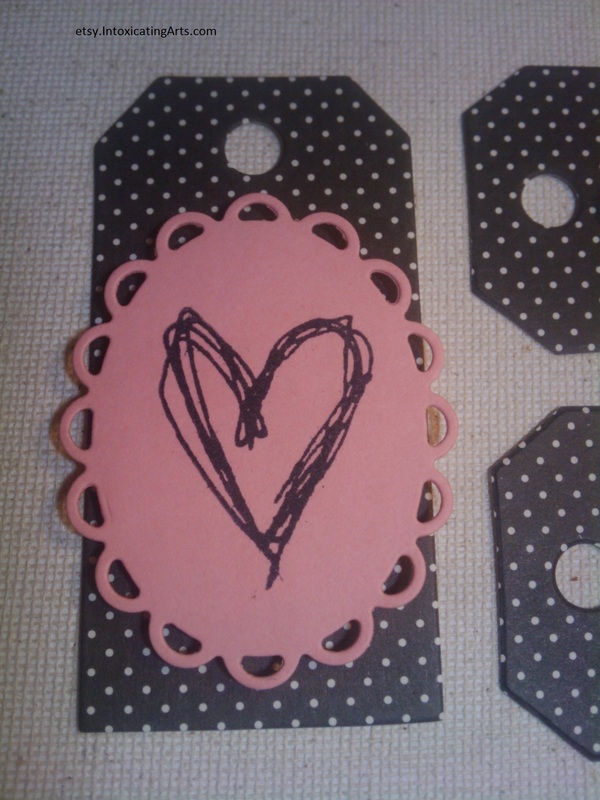 Most of the items used in this card were also handmade. I poured the resin pieces and , of course, I make the Luster Mica Spray Mist. 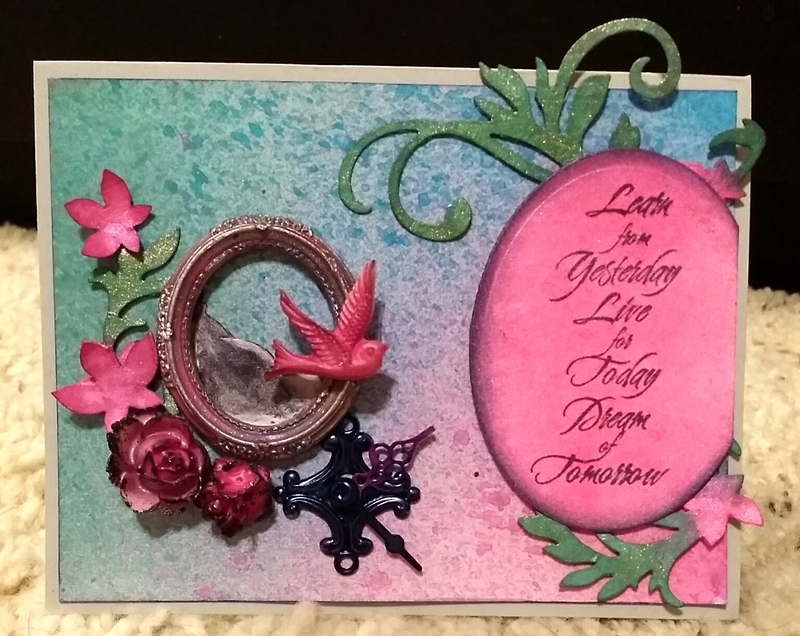 I used 4 different Luster colors on this card. The die cut pieces are Spellbinders. The background paper is glossy photo paper which, to my surprise, holds the Luster Spray Mist very well. I tried to leave hints of past, present and future throughout the card . I used the clock to represent time and bird flying out of the frame as change. There’s multiple different ways to interpret the pieces I used in the card though. I hope you guys like it! These tags were super easy to make and relatively quick. •Two halves of 8-1/2″ x 11″ cardstock papers by Recollections. One in black with white polka-dots and the other in light pink. 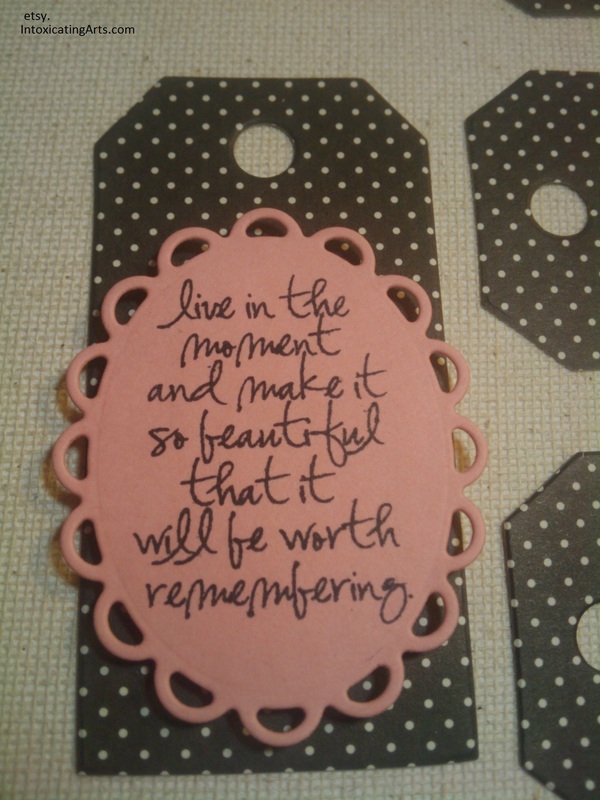 •Various Tim Holtz Stampers Anonymous and Inkadinkado Stamps from multiple different sets. To get started I first measured out how I should cut the paper to maxmize how many tags I could get out of it. One 8-1/2″ x 11″ piece of cardstock produced a total of 12 tags. I made sure to cut out the pieces of paper large enough so I could have enough clearance when cutting with the dies that I would have a 100% success rate. I can not stand it when I’m trying to maximize paper and end up scrapping some out in the process. I cut the paper every 3-1/2″ on the 8-1/2″ side and every 2″ on the 11″ side. Yes, I know those numbers do not add up and you will end up with some unused small strips still.For the scalloped oval I was able to get a total of 15 out of one 8-1/2″ x 11″ piece of cardstock. I cut every 2-1/8″ on the 11″ side of the paper and every 2-3/4″ on the 8-1/2″ side. I was able to get 6 layers of cardstock through the Tiny Tabs & Tags die at a time. That was quick. 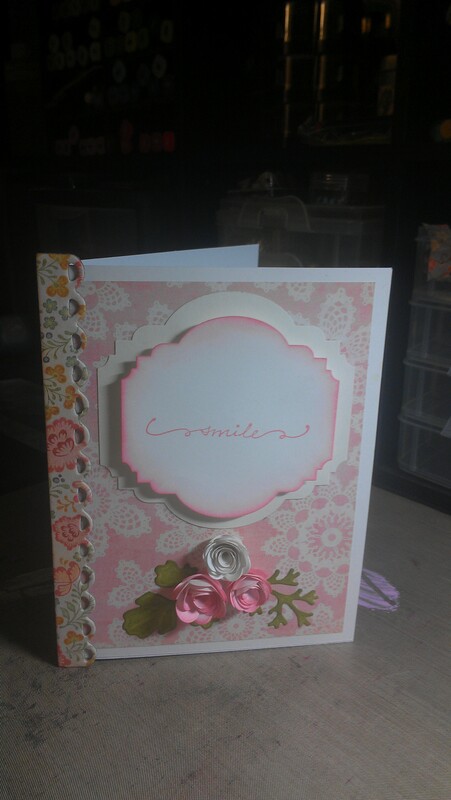 The Spellbinders Lacey Ovals die is only made for one sheet at a time, so that was a little bit of a pain. I also had to stop after each pass through and poke out the spots where the paper was stuck in the lacey part on the die and on my die-cut. 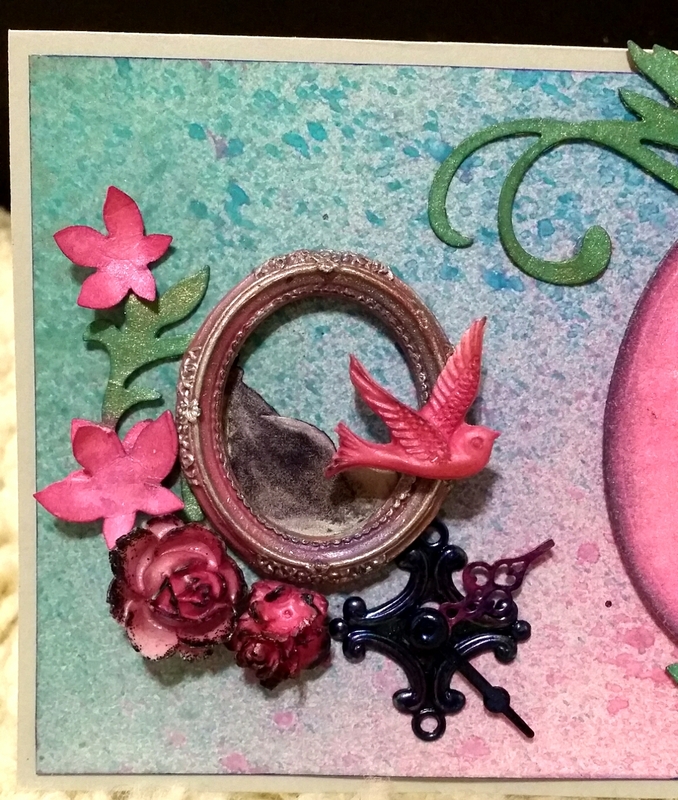 I decided to see if the Spellbinders Lacey Ovals Die could handle two pieces of cardstock at once. My conclusion is that it’s not a good idea. While I know it is not designed for that, I still had to try! You could most likley get two pieces of paper through it, but the cardstock took too much time to pull apart and “fix” after running through two at once. Besides that, I am not sure if doing that is good for your die or your machine. 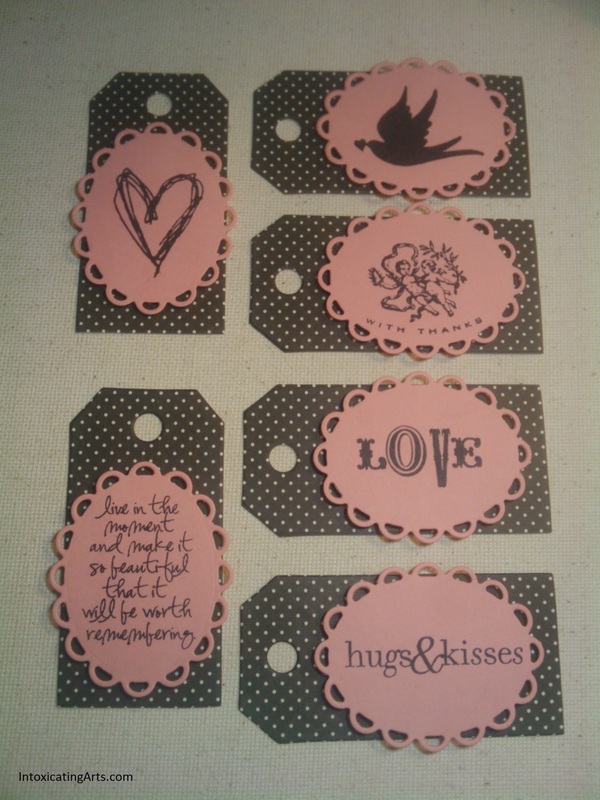 Now that I had all my die cuts ready, I put the tags aside and started stamping the lacey ovals. I browsed through my stamps and pre-picked out the ones I wanted to use. I use mostly clear stamps. 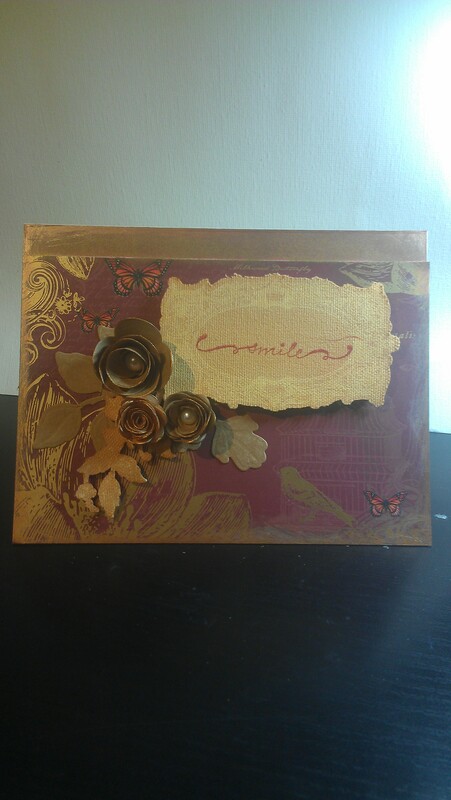 I wanted to move along quickly while stamping, so as I picked them out I mounted each stamp to their own acrylic block. Obviously this is not necessary, but I happen to have a good amount of blocks, so why not use them! After stamping all of my lacey oval die cuts, I left them for a little while to dry. Archival ink takes a little longer to dry than other inks. I had to leave them to have dinner, but normally I’d just hit it with my heating tool and move on to the next step. 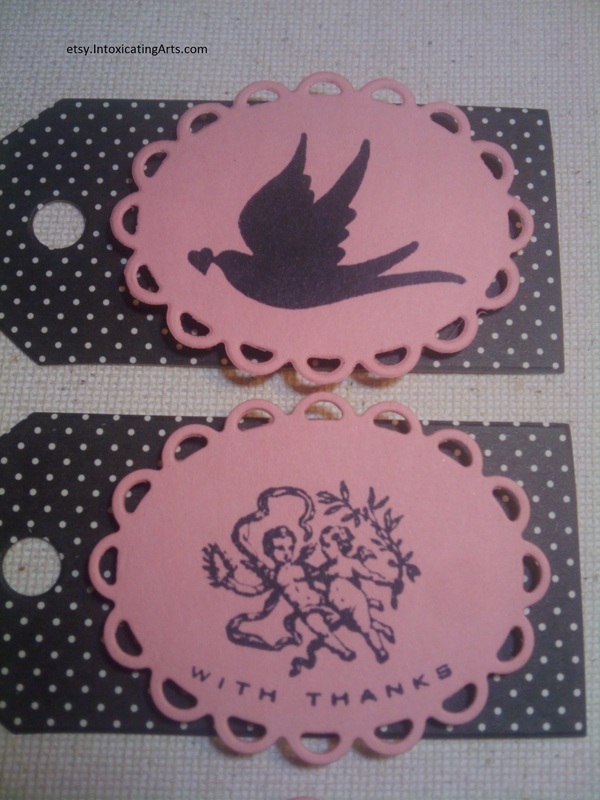 I attached the lacey oval die cuts to my tags with two small squares of foam mount tape (a.k.a “dimensionals” if you’re more familiar with the Stampin’ Up term). That’s it! 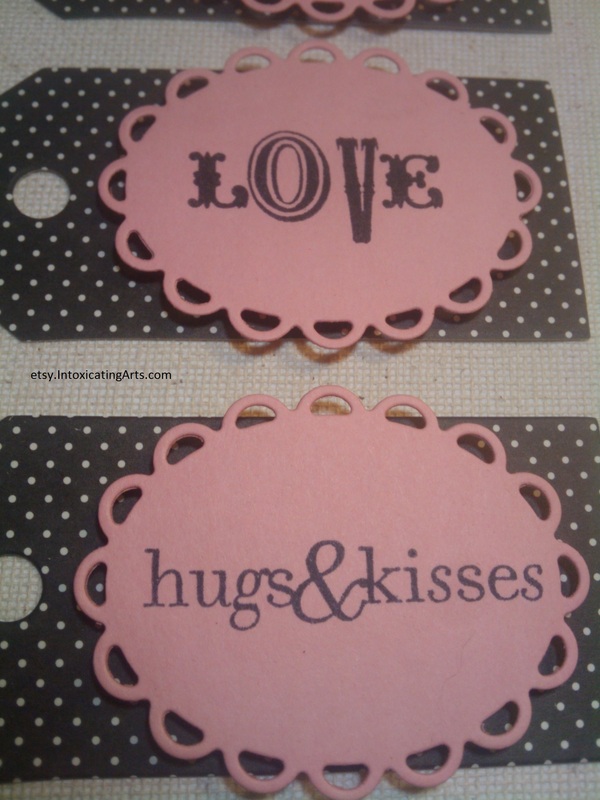 I hope you like these simple Valentine’s / Love themed tags! I am selling one of the sets at my Etsy shop. If you’re interested, they are $4.49 for the set of 6 tags. Click here to go to my Etsy Shop. If you like these tags, have any questions, comments, or knowledge to lend, please comment below! I am new to crafting, so if you have a better way of doing any of the things I did in this process, I am all ears! Thanks for stoppin’ by.